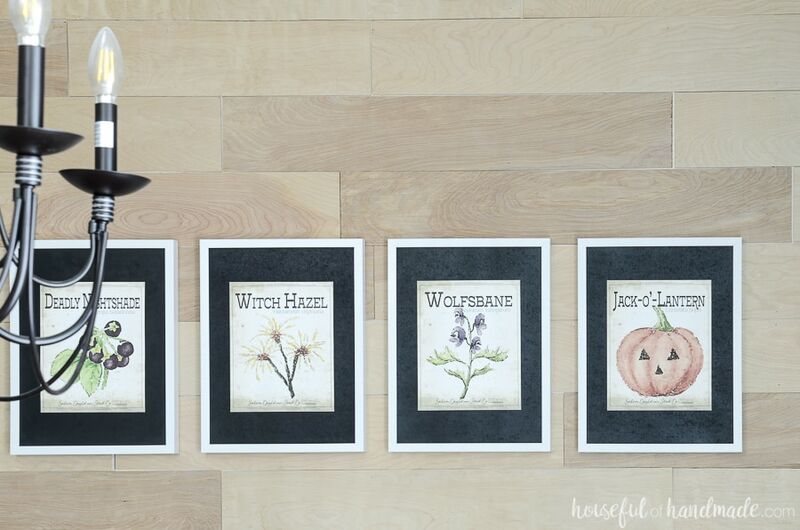 Decorate your home for Halloween instantly with printable Halloween art. Earlier this year someone asked me to make a Halloween version of my vintage seed packet printables. Immediately my mind started churning with the ideas! So I gave my popular seed packet art a spooky side to make this amazing printable Halloween art. 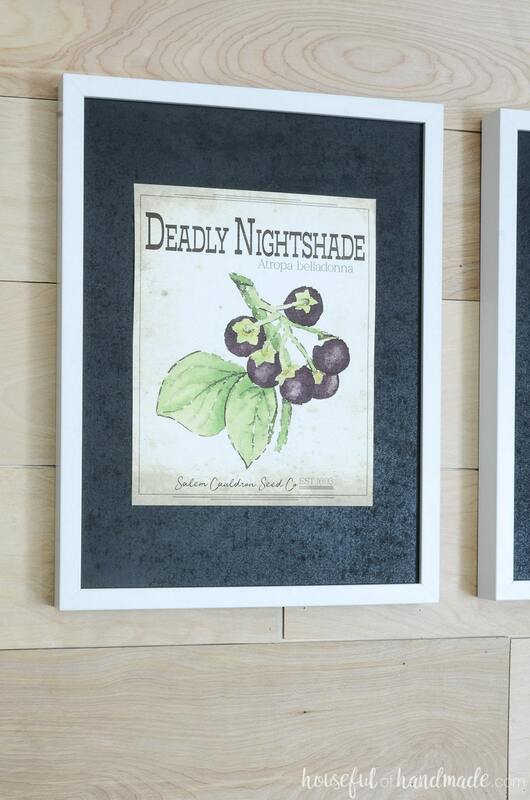 To turn my sweet vintage seed packet art into Halloween decor, I decided I needed to find the spookiest plants. Plants that a witch could use in her potions. 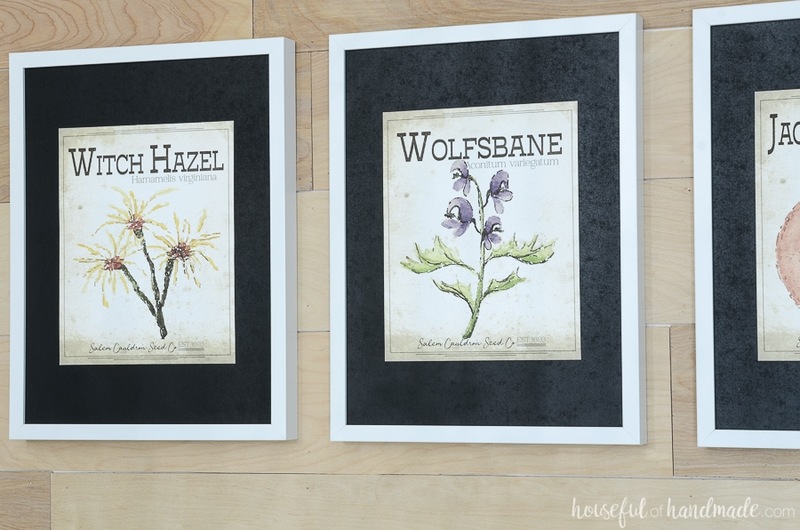 From poisonous berries, to creepy looking “flowers”, these Witch’s Seed Packets are the perfect printable Halloween art! Giving the witch’s seed packet art an extra amount of vintage distressing made them perfect for Halloween. The kids think they are hilarious and love to pretend they are making their own witch’s potions. And I snuck in a little witch history with the “Salem Cauldron Seed Company” logo on the bottom. P.S. Do you know what year the Salem witch trials were? Have a few picture frames in your home that you can quickly change out to new Halloween Printables as the season approaches. Use clipboards (or make this DIY clipboard picture frame) to easily display Halloween printable art on shelves. Use printable Halloween book covers to create decorative books for shelves, mantel decor or vignettes. 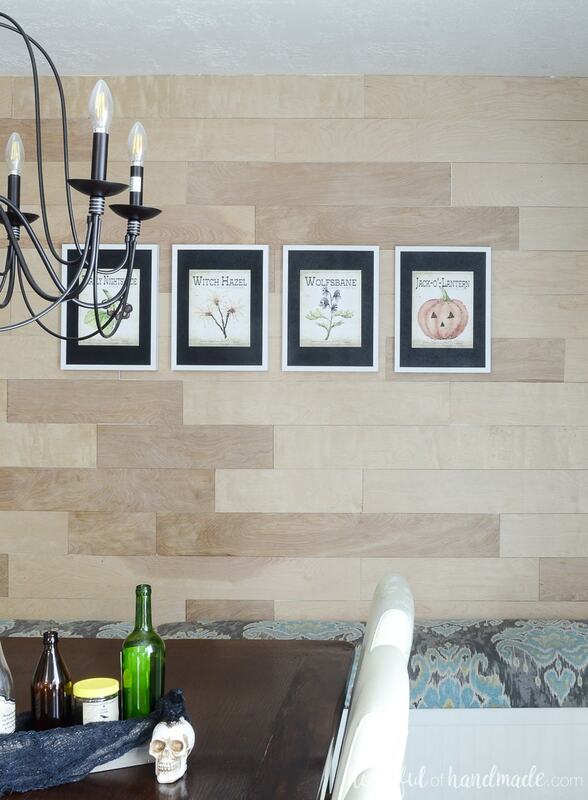 Hang Halloween printables from pant hangers for instant wall art (I like this gallery wall made with pant hangers). We hung our printable Halloween art in our dining room. I have 4 picture frames on our feature plank wall that have no glass in them. This makes it quick and easy to add new printables to the top of the mat in minutes. It’s my favorite way to instantly decorate for any season. On our dining room table I added some of the Halloween decor that we used on our spooky apothecary Halloween mantel a couple years back. 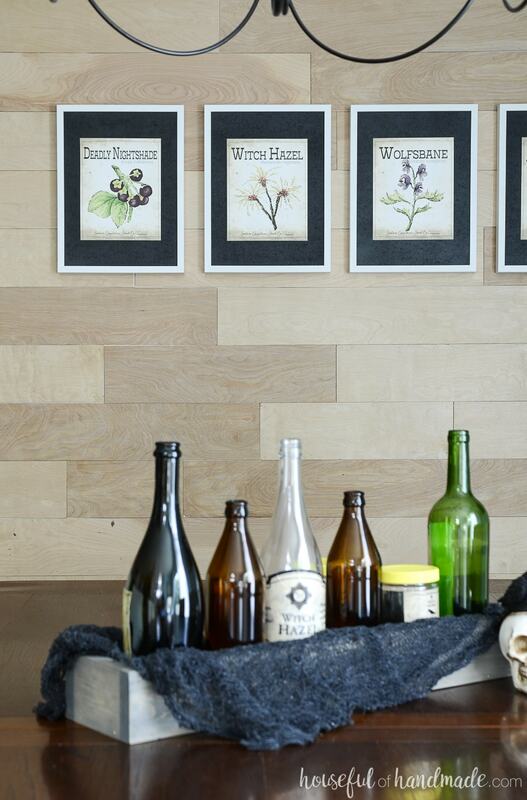 The potion bottles make a great dining room centerpiece. But this printable Halloween art could be used in any room you want to add instant Halloween decor. Have fun with them and have fun decorating for Halloween! I’m already a subscriber, but I forgot my password. Can you please resend it so I can print these great seed packets? Thanks! I include the password in the bottom of each weekly newsletter. The last one was sent last Friday!